GEN has evolved organically from small beginnings. The network itself was founded in 1995 in order to bring together the rich and diverse tapestry of ecovillages and intentional communities that had grown independently across the world. Each community within this network is inspired by the profound belief that their own future, and the world‘s future are inextricably linked. The central tenet is that respect for the natural environment, respect for each other, and respect for individual and cultural diversity, will bring solidarity and unity across the world. The dynamic integration of the four essential dimensions of sustainability – economic, social, ecological and cultural – is the true characteristic of a community-led, participatory ecovillage. Today, GEN reaches out to approximately 10.000 urban and rural communities in 6 of the planet’s 7 continents (not in Antarctica !) located in 110 of the UN’s 193 nation states. As a solution-based alliance, GEN provides information, tools, examples and global representation to the expanding network of all those dedicated to developing and demonstrating sustainable lifestyles around the world. GEN builds bridges between policy-makers, academics, entrepreneurs and sustainable community networks across the globe. GEN has consultative status in the UN – ECOSOC. The Findhorn Foundation is an internationally acclaimed adult education workshop centre and inspirational ecovillage – a Living and Learning Centre for Sustainability. Workshops that are run here benefit hugely from: the inspirational nature of the community in which they are embedded – a model of sustainable human settlement; the caring ethos of the staff who live in and run the centre; and the artistic and beautiful nature of the built and natural environment. All these features make it an ideal place to welcome some of society’s more marginalised people. The Findhorn Foundation is a model for sustainable living. Sustainable values are expressed in the built environment through our ecological houses and innovative use of building materials, as well as applied technology in the Living Machine sewage treatment facility and electricity-generating wind turbines. Sustainable values are also expressed in the community’s social, economic and educational initiatives. We aim to pioneer, inspire, demonstrate, encourage and share our experience. It is the consciousness, motivation, mindfulness, creative energy and joy that we bring to all of these activities that make visions a reality and bring lasting, positive change to the world. p l e n u m – “society for holistic sustainable development” consults, trains and accompanies businesses, organisations and individuals in the areas of sustainability, value-oriented management, corporate social responsibility and social entrepreneurship. Since 2010 we offer a year-long training programme called “Pioneers of Change” that supports social innovators at an early stage. The programme strengthens their leadership capabilities and enhances skills and knowhow to transform individual visions of a sustainable and peaceful society into concrete projects and organisations like social businesses. Since March 2014 ART has been formally part of the global Transition Towns Network which was founded in 2006, Totnes, UK, on the background of the climate, social and economical crisis. The TT Network seeks to help communities to build healthy, resilient, local responses to these challenges and operates in more than 34 countries. ART shares TT’s common culture and network empowerment. ART activities are related with macro-regional and international networking, local communities empowerment, social economy, education, communication, mass-media contact and training. Altekio is a non-profit social enterprise (a cooperative) created in January 2008. Our main objective is to promote sustainable lifestyles for people, organizations and territories in order to move towards a more resilient society, economy and planetary living. We are an organization with a diverse experience in leading, teaching and hosting processes of social transformation and innovation. As trainers, consultants and researchers in the field of environmental, social and economic sustainability, we provide services including the support in the facilitation of leadership, organizational transformation, community empowerment and social entrepreneurship. 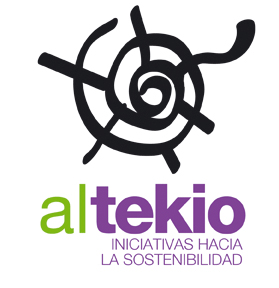 Altekio is also part of a cooperative group (Tangente Grupo Cooperativo – www.tangente.coop) that brings together 17 social enterprises and 87 workers. We share projects within the cooperative group and also with different stakeholders (universities, networks like the Alternative and Solidarity Economy Network, and organizations like Elos Institute, IIFACE- Facilitation and Change Institute). Still Consulting SPRL is a private company focusing on consulting, assisting and researching as well as the education of individuals and teams in holistic business, marketing and human relations systems, strategies and methods. Wind Harvest International is a start up private company, based and founded on holistic principles, with its main focus on the development, design, selling and spreading, of renewable energy, (specifically of 70kW vertical axis wind turbines) into local communities, crises and disaster areas as well as already existing wind parks. Through assisting communities in the process of stepping into ownership of their energy production and becoming independent from the energy market, Still Consulting SPRL / Wind Harvest aims for initiating the process of transitioning towards a respectful, honest and authentic living, in which the 4 aspects of a sustainable lifestyle– the Social, Economic, Ecological and Cultural – are addressed, stimulated and worked on together. AEIDL’s goal is to support the establishment of a Europe made by citizens for citizens, taking into account the unique social, economic, cultural and environmental aspects of each territory, in a process of sustainable development based on equal opportunities and partnership. It was founded in 1988 and is based in Brussels. Its membership comprises around 30 individuals from 12 European Union countries who are involved in, and experts on, local development. Its activities include carrying out projects to promote local development, and implementing contracts for public authorities, especially at EU level. It employs approximately 20 staff. It is a non-profit organisation and devotes its trading surpluses to furthering its objectives. For nearly 10 years (1992–2001) AEIDL animated the EU’s main rural development programme, LEADER. Technical assistance for transnationality in the European Social Fund. It is a founder member of ECOLISE, the European Network for Community-led Initiatives on Climate Change and Sustainability. FFCUL is a private non-profit organization, created in 1993, as an initiative of the Faculty of Sciences of the University of Lisbon, in order to manage financial and administratively its R&D projects. FCUL acts as a third party in those R&D projects based on a scientific agreement in force since FFCUL’s establishment. FFCUL acts as the front institution for a Portuguese scientific collaboration of multiple research groups (research centers for different fields, such as Biology, Chemistry, Geophysics, Information Technology, Physics, Geology, Statistics, Oceanography), with more than 400 ongoing projects. Many of these R&D activities are developed together with international teams and are funded both at national and European levels. Its main purposes are to promote research and technological development activities, provide qualified human resources training and offer consulting expertise and knowledge dissemination.The Faculty of Sciences University of Lisbon (FFCUL) has its mission in teaching, innovative research and knowledge transfer in the areas of exact, natural and techno sciences, as well as in producing, disseminating and sharing knowledge and cultures. It is engaged in stimulating an ongoing and open dialogue with civil society through multiple interconnections with social and economic actors. FFCUL is internationally recognized as a benchmark institution in the creation of scientific knowledge, promoting excellence in teaching, research and the enhancement of social and economic knowledge. The Faculty’s current Strategic Objectives include promoting the social and economic value of knowledge and ensuring the sustainability of the economic sphere. The Faculty hosts the Laboratory for Systems, Instrumentation and Modelling in Science and Technology for Space and the Environment (SIM), a research center established in 2003. The SIM laboratory has two research groups, among them one on Climate Change Impacts, Adaptation and Modelling (CCIAM), mostly funded by the European Union. CCIAM integrates 7 PhDs and 20 Masters and graduates that support the ongoing European and national research projects as well as national and international services in the fields of Climate Change and Sustainability.